This new format of spreading international games over several days is still taking a bit of getting used to. Some people seem to have just got bored and given up entirely. I was amused to discover that more viewers tuned in for the BBC quiz show Pointless on Saturday night than for ITV’s coverage of England v Slovenia. I’ll let you do your own puns. The quiz show averaged 4.99m viewers with a peak of 7.26m while the football averaged 4.56m with a peak of 6.3m. By all accounts England were pretty terrible and still won pretty comfortably. It’s not surprising then that interest in this current team and qualifying group is so low. TV producers love to get those shots of teams emerging from the bus and entering the stadium. Most players bounce off the bus with enormous headphones and try to either put their most serious game face on or make a strenuous effort at appearing serene. Some have huge bags and suitcases as though headed for a fortnight on the Costa de Sol while others make do with just a tiny wash bag. The scene then cuts to the studio where former pros will make their pronouncements: “the boys look relaxed” or the “boys look focused” or “the boys look up for it.” Actually, the boys just got off a bus, that’s all. I wouldn’t read too much into it. The tendency toward pointless analysis is now reaching such heights that it surely can’t be long before ‘the boys getting off the bus’ becomes subject to video analysis with slow-motion replays and comment being made on the formation. There are no points available on Tuesday night when Scotland and England clash at Celtic park in what’s likely to be a feisty friendly. Viewing figures will probably be considerably higher than for England v Slovenia. The other game that I was interested in at the weekend was Italy v Croatia. My love of Italian football has been well documented on this blog but Croatia is my adopted home (and team) as my wife is Croatian. A 1-1 draw in Italy was a good result for the boys in the tablecloth tops but sadly, like a 70s disco act, Croatian supporters got a bit carried away with their flares. The game was interrupted twice as a result, with the players taken off the field for 10 minutes on the second occasion. This is not the first time such incidents have occurred with Croatian fans (and they are far from the only ones who treat flares as a routine part of the match day experience) and I think it’s time that the authorities got stricter on stamping out flares at games. 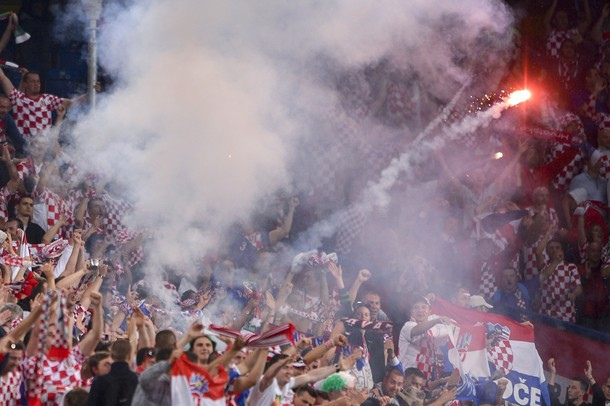 Let’s hope in future that Croatia’s considerable flair on the pitch is not overshadowed by a minority of fans who insist on the pointless endeavour of lighting flares in the stands. This entry was tagged BBC, Croatia, England, flares, international fixtures, Italy, ITV, Pointless, Scotland v England, Slovenia, viewing figures. Bookmark the permalink.